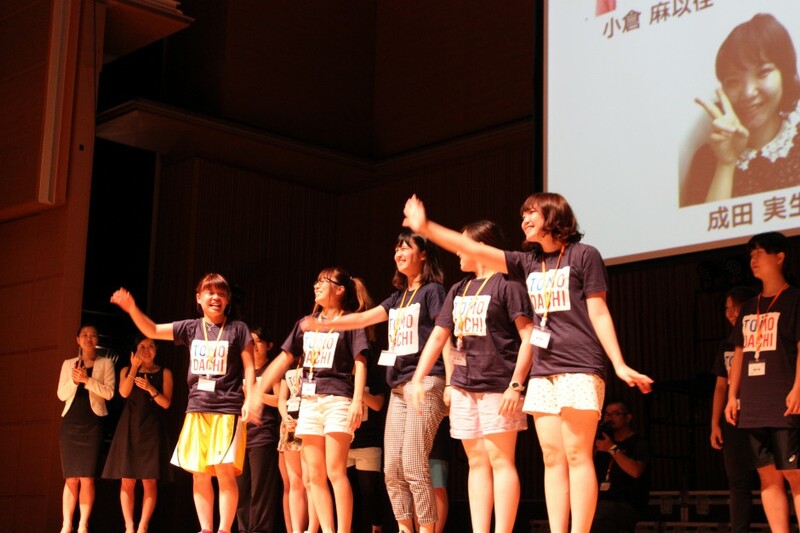 On August 22, 2014, TOMODACHI High School Women Career Mentoring Program kicked off their 4 Step program.This program provides 120 female high school students from Fukushima prefecture to support their careers and to provide options for their future through sessions with international students and young professionals from all over Japan. Fifteen TOMODACHI alumni that had participated in the TOMODACHI Coca-Cola Educational Homestay Program, TOMODACHI Softbank Leadership Program and the TOMODACHI MUFG International Exchange Program participated as mentors, and will be providing support and encouragement to these students throughout this career mentoring program. This half year program is divided into four stages and this Young Americans song and dance workshop was Step 1 of a four step program. 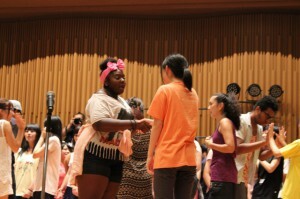 For three days from August 22, the Young Americans and the participants worked together to create a one-hour dance show. Using English and music as common tools recognized around the world, the participants bonded by opening up and accepting each other for who they are. Prior to the workshop, the participants had a chance to meet each other for the first time. They divided up into small groups and had to introduce themselves. Although the participants seemed slightly nervous at first, the energetic and dynamic atmosphere helped make the students comfortable and they began enjoying the lively session. On August 24 at the end of the workshop, the students excited the audience as they performed, bursting with energy, and their show touched many people’s hearts. From November 1-2, 2014, Step 2 of this program will commence. The program will be held in Inawashiro City, Fukushima and will host international students from around the world. Students studying abroad in Japan from Europe and Asia will share their stories of what brought them to Japan, what kind of work went in to make it happen, and their hopes and dreams for the future. The young Japanese students will listen to the stories of inspiring university students and to learn about leaving their comfort zone and tackling challenges in a new environment.